How good are you in observing a given picture? If you think that your visual skills are good, then this is the puzzle worth trying to test your observation skills. Can you tell which cup will get filled first? Which Cup will get filled first? The Answer is #8. 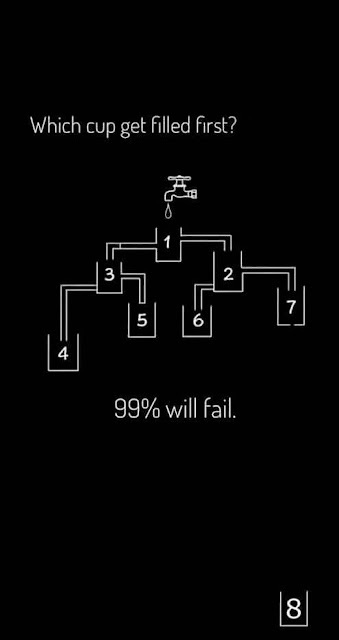 Exit towards 3 and 6 is blocked and 7th is leaking which will not let 2 and 1 be filled but it will fill out #8. What about #8... #7 Is leaking into it so wouldn't it get filled up? You are right. It will be #8 which will get filled. 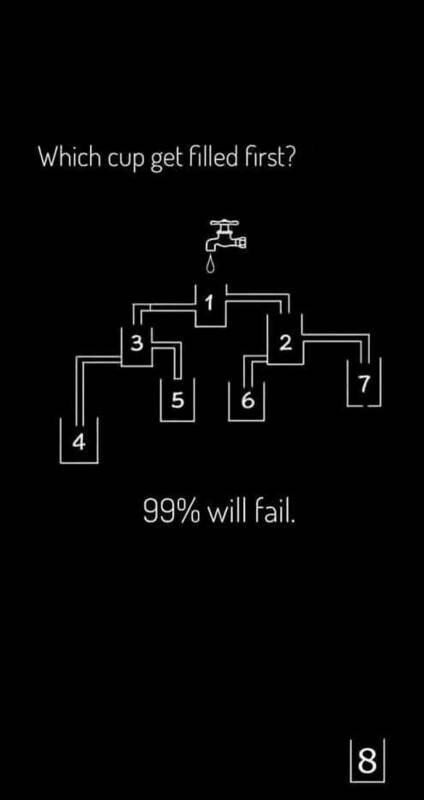 Leaked water from #7 will fall into #8. We have corrected our answer. I said #4 thinking it was the lowest and would fill first as "room" flooded from the hole in #7, but only because I could not see cup #8 thanks to the ad bar covering it up.